NAVTEX decoder is an imaginitively named NAVTEX software decoder for NAVTEX transmissions. All you need is a shortwave radio and a computer to begin decoding signals yourself. I currently have the program running continuously and uploading NAVTEX messages to an online database. 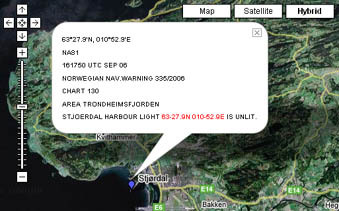 The data is also available via WAP at wap.frisnit.com so you can view the messages from your boat on your mobile. From version 2.1.0 you can set up your own local NAVTEX service. This version will automatically upload your messages for viewing online. Apply here for an account on the online database and set up your own NAVTEX receiving station today! This project has evolved over the last few years and has been driven by an interest in radio, a career in software and a desire to read NAVTEX messages on a boat without having to shell out for another piece of hardware. will return all the met forecast messages (E) from Alex Radio(N) and Cyprus Radio(M) from receiver 110CY10. The responses are sent as soon as they're received, however there may be delays due to the mailservers at both ends. Make sure your spam filter is set to allow emails from . This release fixes a crash on startup that was affecting some users. The tuning display can now be viewed in logarithmic or linear format. The new version has an improved interface for viewing past messages. A number of bugs have also been fixed, including a quite serious one that limited the size of uploaded messages. If you're not running Windows then try the Java NAVTEX decoder. At present it's still in development and only has basic decoding ability, but is just as sensitive as the PC version and all in less than 100kb! It should run on any Java platform so give it a try and let me know how you get on. The Eastern-most message received so far is this one from the North East coast of Hokkaido. 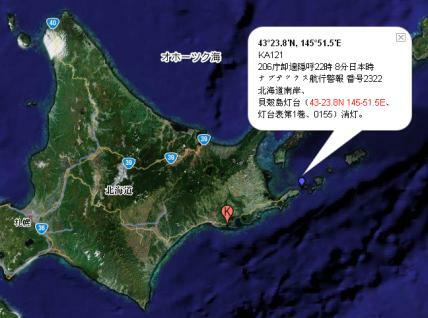 It's a NAVTEX-J message from Kushiro (K) on 424 kHz concerning the lighthouse on Kaigara-jima which is unlit. This is not entirely surprising when you see a picture of it. The database now supports Unicode station names and locations in case you need to use non-Latin characters. Featuring improved decoding ability, comprehensive logging and a more flexible GUI. Full details available from the download page. The interactive Google message maps are now working with IE and Firefox. If they don't work with your favourite browser then let me know (unless it's Lynx). If you haven't tried them then you don't know what you're missing! Registrations are working again after a few days of dysfunction. You can apply for an account on the database here. If you have any problems then let me know. Version 2.1.0a has been released! Finally a new version! This has improved decoding ability for very weak stations and now features SmartTune which will automatically lock on to NAVTEX transmissions to allow the decoder to operate unattended. This version will also automatically upload received files to the online database. You can get an account on the database immediately here. Now you can do simple text searches for the whole database, as well as filtering by station and message type. Try searching for dead whales. You'd be amazed by the number that find themselves bobbing about in the Channel. Tremendous excitement was had after returning from the pub this evening and finding a message from Reykjavik waiting for me. It's pretty badly corrupted, but the reference to Kangia clinches it I reckon. Made the decoder less strict about applying the FEC error detection to noisy NAVTEX signals. Now the decoder tries to guess corrupted characters by calculating the minimum Hamming distance to a valid character. It's not an amazing improvement but it made some previously garbled transmissions readable. This will be incorporated into v2.1.0 when it's released. This morning I received Las Palmas NAVTEX station for the first time. I nearly didn't notice it in the log because it shares the same station ID as Gothenburg which is regularly received. It was only when I saw some pins around the Canary Islands in the NAVTEX map view that I realised. Maybe it's just coincidence that I added the preamp to the antenna two days ago or maybe it's just the weather. Either way it's pretty good for a hula hoop propped up against the wall of a balcony in South East London. I had this preamp sitting in a box of junk for years left over from an old homebrew receiver. It was even still tuned to 518kHz. Today it finally occurred to me to connect it to the Hula-Loop. The signal strength meter on the DX-394 went off the scale when Den Helder came on air. Should've done this months ago. Restructured the WAP pages for quicker menu/message display time at the expense of slightly larger deques. Also reduced the number of network requests required for a typical session. First positive ID of Arkhangelsk NAVTEX station. The message was pretty broken but there nonetheless. This weekend I trawled the toyshops of South East London to find hula-hoops to build a Hula-Loop antenna like this one. It's almost impossible to find hula-hoops that don't have integral flashing lights etc. which I reckon will affect the dielectric properties of the loop. Finally the Early Learning Centre in Bromley delivered the goods. Added a WAP interface to the NAVTEX database at wap.frisnit.com so I can browse it on my mobile. I'm going sailing with Tim this weekend so it'll be a good test. Hopefully it'll work on Tim's Nokia else we'll be at the mercy of the river Crouch. Put together a simple web interface to the NAVTEX message browser. It's a bit ropey, but it'll do for now. Created a special build of the decoder that uploads messages to an online database. Scored a Realistic DX-394 from eBay to replace the Sony ICF-SW7600 I've been using. The DX-394 is stable enough to leave unattended allowing stations to be logged 24 hours a day. First free version relased. Fixed a fundamental problem in the audio capture system. FIR mark/space filters added to improve noise performance.